A semi truck left the roadway and crashed on Webber Canyon Road in Benton City on Thursday night, leaving two people injured, according to the Benton County Sheriff's Office. Photos from the scene show a semi truck crashed into the side of a hill after it had apparently crossed the median of Interstate 82 and went over an embankment. Police say that the cause of the accident was inattention, and that the driver of the semi truck was cited for second-degree negligent driving. The driver of the semi and a passenger suffered minor injuries in the crash. They were sent to Kadlec Regional Medical Center in Richland as a precaution. In Washington state, Negligent Driving 1 is a criminal traffic offense. The offense is a misdemeanor, punishable by up to 90 days in jail and a $1,000 fine. Negligent Driving 2 is a non-criminal traffic infraction and carries a fine of $250 and an aggregate total fine of $550. Unlike DUI convictions, there is no mandatory jail time requirements for Negligent Driving, so community service, work crew, and electronic home detention are all alternatives if you are convicted of negligent driving. Negligent driving charges are often filed when there is not enough evidence to support a DUI charge. In Washington state, drunk drivers facing a DUI charge may have their punishment reduced to Negligent Driving during the negotiation process. Those that are charged with Negligent Driving 1 face serious consequences outside of the court system. Violators face possible loss of employment and probation. The truck accident lawyers at Davis Law Group, P.S., represent passengers, cyclists, bikers, pedestrians, and truckers who have been hurt in an accident with a large truck or tractor trailer. Attorney Chris Davis — founder of Davis Law Group — is unique in that he has developed a special focus on these complex, heavily-defended cases. For 24 years, Mr. Davis and his experienced legal staff have represented truck crash victims throughout Washington state. Our truck accident attorneys are dedicated experts in aggressively pursuing the justice and compensation that our clients deserve. 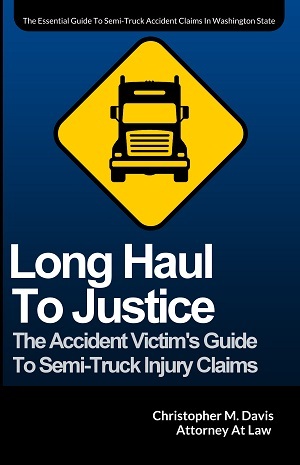 Each member of our firm has extensive experience in these heavily defended truck injury cases. Contact us today for a free, no obligation case evaluation. Call (206) 727-4000, use the chat feature below or fill out the form on this page.